By March there are usually some small signs of spring – a few early bulbs poking out of the ground, birds singing, a hint of warm breeze in the air. Nope. None of that this year. We are still buried under snow and breaking all-time cold records for sub-freezing temperatures. So the snowy mailbox stays up for another week. Return to the star-crossed galaxy far, far away as the brooding young hero, a power-mad emperor, and their jesting droids match wits, struggle for power, and soliloquize in elegant and impeccable iambic pentameter. 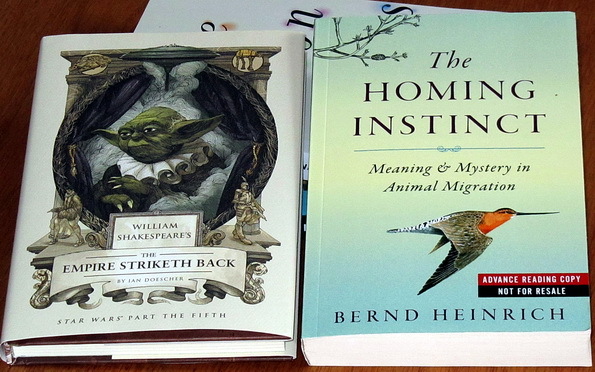 The Homing Instinct: Meaning and Mystery in Animal Migration by Bernd Heinrich from Amazon Vine. 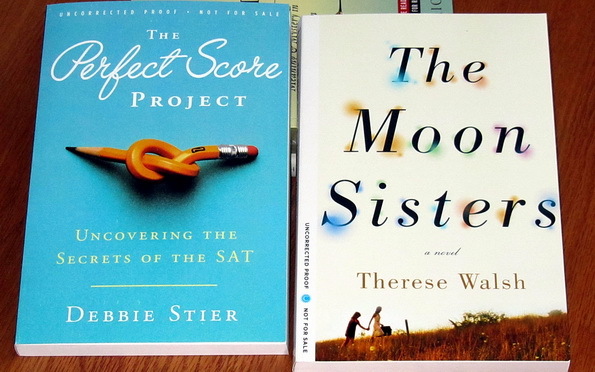 The Perfect Score Project: Uncovering the Secrets of the SAT by Debbie Stier . The Moon Sisters by Therese Walsh from Crown Books. I bet The Homing Instinct is good – love to know about how birds migrate and then find their way home. The Moon Sisters sound interesting. I enjoy Magical Realism. I’m listening to The Perfect Score Project and it’s interesting but I feel like parents of younger children would like it more than I am. It includes a lot of test prep hints. The Homing Instinct looks perfect for you! The Homing Instinct looks excellent, for a birdwatcher like myself! Enjoy! Looks like we’ll both be reading the Star Wars Shakespeare rendition! These all look wonderful! I’ve had my eye on The Moon Sisters. Enjoy! Looks like some good ones, although The Empire Striketh Back but be a bit too much. Enjoy! The Moon Sisters sounds good! Have a great reading week! Leslie, enjoy your new books! I also received The Moon Sisters for review. Nice variety — The Homing Instinct looks good –enjoy all. I’m curious about the SAT book.